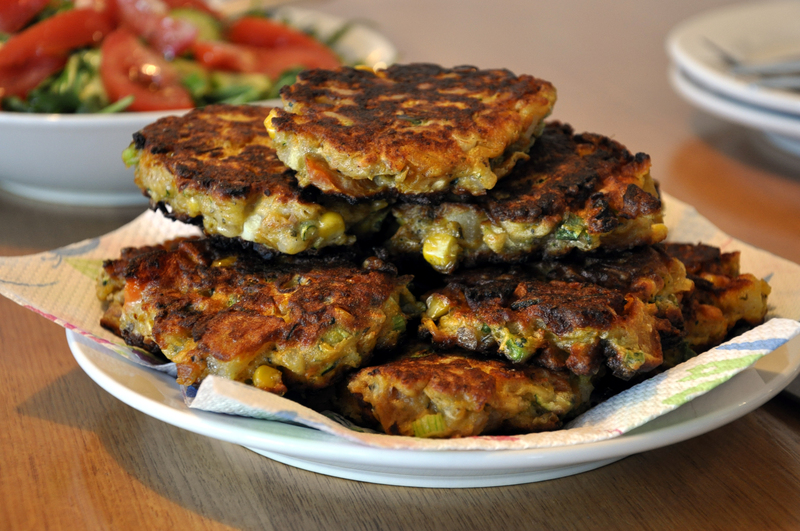 This is a brilliant way of using the leftover vegetables from a roast dinner, in fact, these burgers are so good, I’d prepare them especially to serve as a vegetarian option at a BBQ. Don’t limit yourself by the vegetables I used, I had a mix of potatoes, carrots, pumpkin, parsnips and sweet potato that had been roasted with garlic and dried herbs. You could also include spinach, red capsicum, mashed chick peas, lentils and so on, just be mindful that the mix needs to be stiff. Roughly mash the cooked vegetables. Mix in the remainder of the ingredients and season to taste. You should have a fairly stiff mix. If the mixture is too dry to integrate all the ingredients, add 1/4 cup milk or yoghurt. Heat some grapeseed oil in a pan. Drop large spoonfuls of burger mix into the pan and cook until well browned, turning once. Transfer the burgers from the pan to an oven tray and bake for 10 minutes to ensure they are cooked in the middle. This amount makes 10 good sized burgers. I’ve had a go at making this dish and I think it’s the roasted vegetables that make the difference. What a clever idea. Well, because they are thick they will be a bit rubbery without some sort of raising agent, you could use SR flour instead. I guess you’ll have to rust my experience on that one! Yum, but why the bicarb of soda? I have never come across that before except in cakes that use plain (non rising) flour. This entry was posted on October 25, 2012 by ladyredspecs in Breakfast and Brunch, Food, Light Savoury Dishes, Main Meals, Vegetarian and tagged burgers, roasted vegetables, vegetarian.